Julie Payne-Kirchmeier and Brad Zakarin speak during Wednesday’s ASG senate meeting. The two NU administrators were invited to participate in a Q&A about the future of Hobart House with concerned members of the NU community. 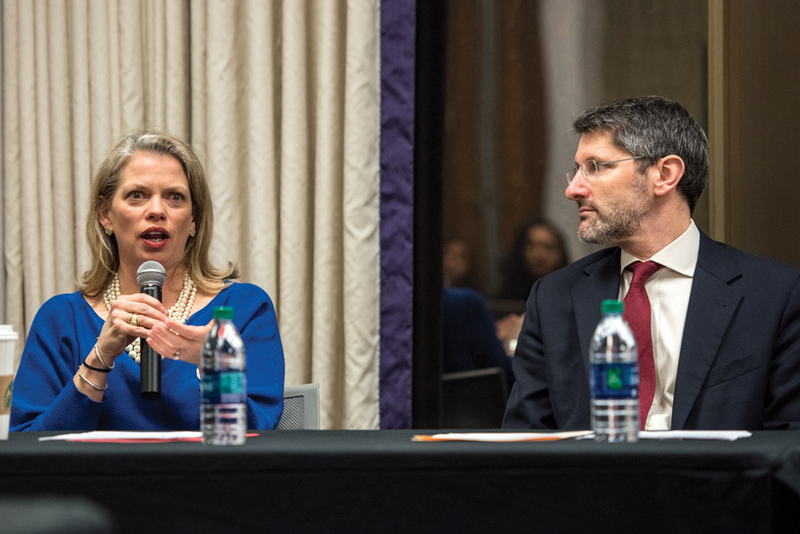 Northwestern administrators confirmed the University’s commitment to maintaining non-greek, all-women residential spaces in a Q&A session held during Wednesday’s ASG Senate meeting. Hobart House will exist for the “foreseeable future,” administrators said, though the building’s long-term fate is unclear. The continued existence of non-greek, all-women housing was thrown into jeopardy after NU announced plans to create a “universal residential experience” that would reconfigure on-campus housing. The 114-page report released in January 2018 by the Universal Residential Experience Committee made no explicit statement of an intention to maintain an all-women’s living space within the new model. That ambiguity led sophomore Elynnor Sandefer, the Rainbow Alliance senator and a member of the Hobart House executive board, to write legislation demanding the University preserve a separate building for women-identifying students. ASG Senate invited Dr. Julie Payne-Kirchmeier, the associate vice president and chief of staff for student affairs, and Brad Zakarin, the director of residential academic initiatives, to its Wednesday meeting to hold a Q&A with ASG Senators and concerned members of the NU community regarding the future of Hobart House. Hobart House opened in 1928 as a non-greek housing option for women. Approximately 50 students live in the building each year. During the Q&A, students cited a large gap between a living space, which could be a single floor within a co-ed building, and a separate structure for women. Nicole Roberto (Weinberg ’18), a former Hobert House resident, said it’s important that the community remain in a separate building. One issue, brought up by Zakarin, is the projected growth in student desire to live in all-women housing that will likely exceed Hobart House’s 50-student capacity. At that point, the University will have to decide whether to place the extra students into an all-women floor of a co-ed building, designate a second all-women building or move all the students into a different all-women building with a larger capacity, he said. Payne-Kirchmeier added that nothing was off the table, including the long-term preservation of Hobart House. But, she said, the University would need to first conduct focus groups and surveys and solicit feedback from relevant stakeholders before releasing its final plan for all-women’s housing.